Mention Wirra Wirra to wine lovers throughout the world, and this is probably the wine that they will think of. This was the first Wirra Wirra wine made by Greg Trott. McLaren Vale is a great source of juicy warming reds and Wirra Wirra is one winery that has plenty of them to offer among their portfolio which also includes a well made moscato and rosé bearing the name of Mrs Wigley. The 2016 blend has a smidge more Cabernet Sauvignon in the blend at 52% Cabernet Sauvignon, 37% Shiraz and 11% Merlot. 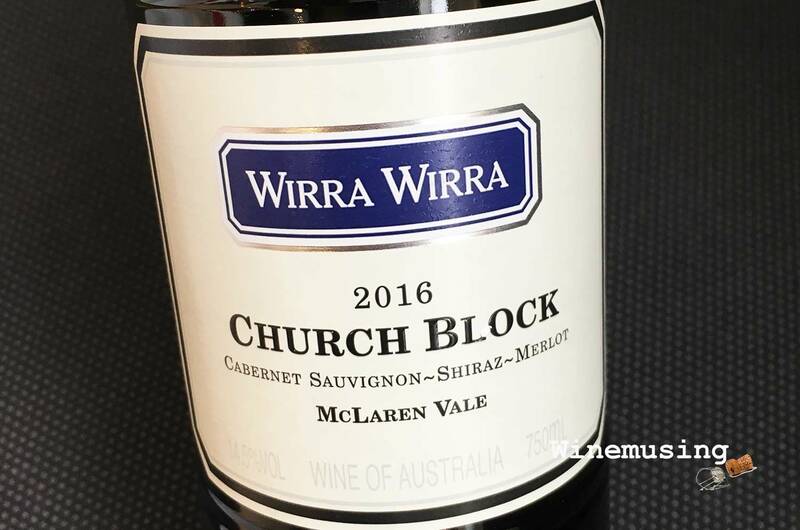 There is plenty to love about the Church Block blend, starting with the price tag. Just as easy to love is the fresh raspberry and black fruit, pepper, dried herbs and vanilla, cinnamon spice. Soft, well-judged oak has given an extra roundness and plushness to the wine and a savoury edge. The fuller body, soft mouth filling tannins make this a wine that is an easy choice. Plus it makes a good candidate for some short term cellaring. Lots on offer in the bottle here.